Welcome to the Trading Post. Formerly Rosemary's Shop, the Trading Post still stocks local produce and goodies from the Yorkshire Dales as well as our own delicious homemade preserves - plums from the plum tree by Layhead Farmhouse plus soft fruit from Rosemary's garden. Produce and groceries can be ordered from The Trading Post either by phone, email or post, before you leave home ready for your arrival at your cottage, and items can also be purchased during your stay. If you order when you get here, armchair shopping works like this! Each visitor is given a shop order form upon arrival where you can chose from a wide range of produce. Place your order in the Layhead post box near the laundry before 8pm then your goodies will be delivered to your cottage by 9am the following morning. Payment for the goods is due upon delivery please unless arranged otherwise. Copies of our shopping list is available to download by clicking here but we do always send a shopping list together with your balance confirmation letter. 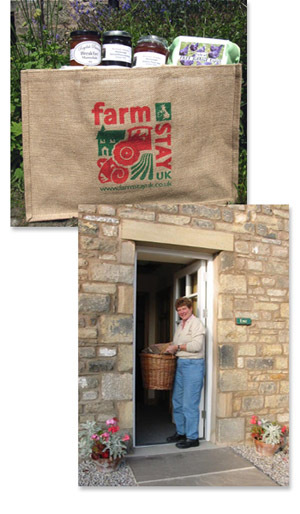 You can also purchase eco-friendly Farm Stay shopping bags. They are large with strong handles and have many uses including carrying your shopping! "Hello Rosemary, just wanted to thank you for looking after us at our stay on your farm. We did enjoy the Victoria plum jam and the pork and apple sausages. Mr & Mrs B, Newcastle"